WASHINGTON (CNS) — Kristen Uitenham, like many other young people, hopes to one day attend the international World Youth Day with the pope abroad, but she still jumped at the opportunity to join with others at a celebration closer to home. Uitenham came on a bus from the Archdiocese of Newark, New Jersey, with about 60 others from her archdiocese to “Panama in the Capital” on the campus of The Catholic University of America in Washington Jan. 26. While it was a bit colder in Washington than in Panama, you couldn’t tell that from the smiles of passers-by on the streets, walking happily in small crowds among the buildings on Catholic University’s campus, the Basilica of the National Shrine of the Immaculate Conception, and the St. John Paul II National Shrine. The 1,400 pilgrims in the capital enjoyed a day much like those in Panama encountered. 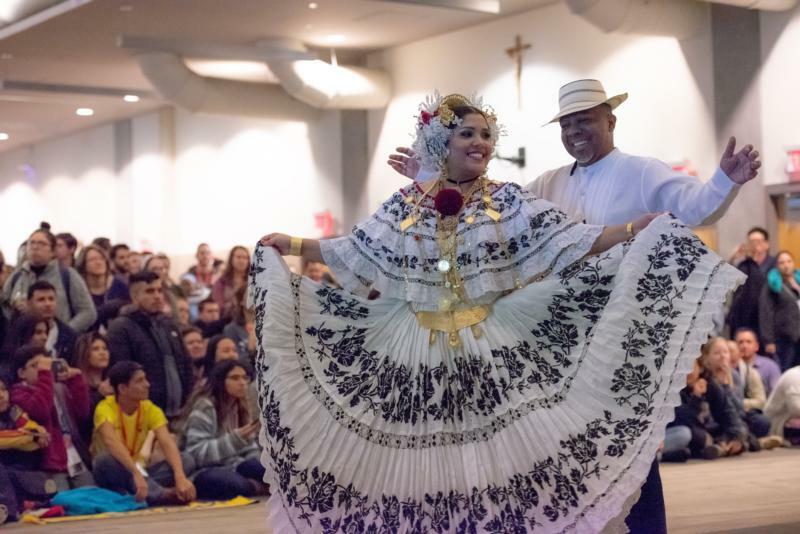 The schedule included talks and performances by Catholic speakers and musicians from around the globe, food trucks and a traditional Panamanian dinner, and plenty of opportunities to engage in the sacraments. Confession and eucharistic adoration were available, in addition to a vigil Mass, and candlelit Stations of the Cross later in the evening. Uitenham was able to reconnect with her spiritual director who had come from Michigan, and she said she was looking forward to reading a book of devotionals she purchased from the vendors. Pilgrims from the Washington area included a group from St. Charles Borromeo Parish in Arlington, Virginia. Sergio Martinez, a Catholic University alumni, who attended World Youth Day in Krakow, Poland, in 2016, said they were excited to take part in the event, and share the joy and faith of the pilgrims in Panama. Rene Pinilla, who is from Panama, arrived later in the evening because he tutors children on Saturdays. Once he arrived, he enjoyed sampling the food of his native country, especially the “cocadas,” or coconut cookies. He was happy to see a both highlighting Panama’s history and culture and inviting tourists to visit there. Another member of the Virginia parish, Patrick Realiza, who is a lector and men’s group leader there, said he has always wanted to attend a World Youth Day festival. When he heard of the local event “right here in our own backyard,” he said he felt drawn to the “piece of Panama experience” and the opportunity to engage with other young adult Catholics. World Youth Day events offer opportunities for young people to recharge and embolden each other to live for Christ, and those at “Panama in the Capital” interviewed by the Catholic Standard said the topics covered during the speakers’ sessions were relevant in their lives as active Catholics. Joo Yen Hong, originally from Korea, who is now a member of St. Stephen Martyr Parish in Washington, was an attendee and volunteer at the event. She found the panel on marriage and dating helpful for the young people present, as well as full of great stories and encouragement. She also appreciated the beauty of the candlelit Stations of the Cross in the basilica’s Crypt Church. Emmanuel Alakwe, originally from Nigeria, also attended “Krakow in the Capital” in 2016, and wanted to hear the talks and engage in prayers again with other young adult Catholics. Abraham Da Silva Vidao, born in Venezuela and raised in Portugal, traveled with another group of around 60 people from Knoxville, Tennessee. Hamilton writes for the Catholic Standard, newspaper of the Archdiocese of Washington.